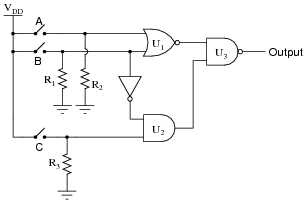 Output of AND gate U1 fails high: Gate U4 output simply equal to [`D], no other inputs have any effect on U4's output. 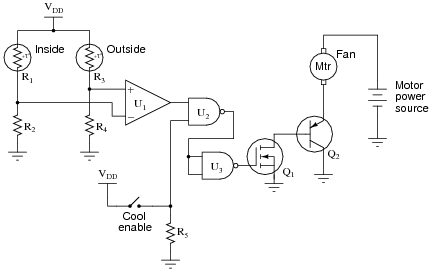 Output of AND gate U2 fails high: Gate U3 output simply equal to [`C], no other inputs have any effect on U3's output. 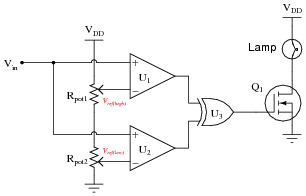 Output of NOR gate U1 fails high: Gate U4 output simply equal to [`C]D, no other inputs have any effect on U4's output. 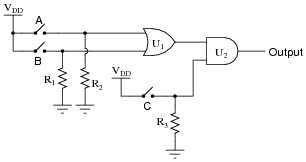 U3 and Q1 are the most suspect components, given the behavior of the circuit. I'll let you figure out what to measure next! Discuss your students' answers to this question and their troubleshooting strategies. The latter part of the question, where students are asked to explain what they would do next, is the most important part! Discuss your students' answers with everyone in class, and their reasoning behind them. 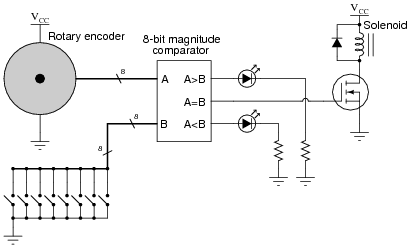 This classic problem is caused by a lack of pullup or pulldown resistors on CMOS gate inputs. Students think I'm a wizard by being able to troubleshoot their CMOS circuits just by waving my hand next to them. No, I'm just wise in the ways of common student error! Now, obviously the output of the gate is "high" when the LED is on, otherwise it would not receive enough voltage to illuminate. 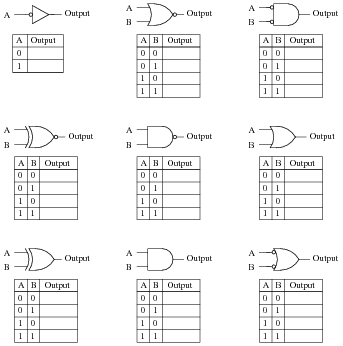 Why then does a logic probe fail to indicate a high logic state at TP2? I won't give away the answer here, but it has something to do with proper CMOS logic level voltages. Follow-up question: this LED circuit is rather simple, and the scenario almost silly, because the LED's presence makes checking the logic state at TP1 and TP2 superfluous! 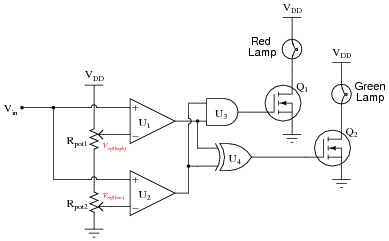 Can you think of any other circuit or situation where a similar false reading may be displayed by a logic probe - where the logic state has not been made visually obvious by the presence of an LED? It is easy for students to overlook the limitations of a logic probe, and to forget what actually drives it to say "high" or "low" when measuring a logic level. This is why in low-speed circuits I prefer to use a good digital voltmeter rather than a logic probe to discern logic states. With a voltmeter, you can see exactly what the voltage level is, and determine whether or not the logic state is marginal. 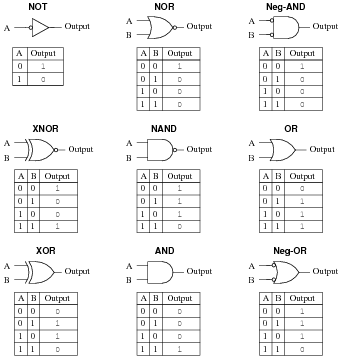 Since most digital electronics textbooks discuss logic pulsers along with logic probes, I'll let you do the research here and share with your classmates and instructor what you found! 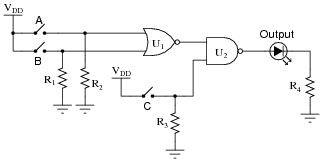 Students may wonder how a logic pulser is able to override the output state of any gate it's connected to. The answer has to do with the brief time that a pulser operates, and also the pulser's low impedance (compared to the relatively high impedance of the overridden gate output). In this location, the pulser is set up to test gate U1. We would have to use a logic probe with "pulse" indication capability on the output of U1 to complete the test. The pulser requires a ground connection so it may drive current into or out of the circuit under test. 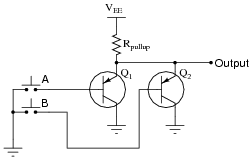 Without a ground connection, there would be no complete path for current, and the pulser would not be able to överride" the output state of the NOR gate. The point I am trying to convey with this question is that forcing a gate's output high or low with a logic pulser tells us nothing about that gate. We use a pulser to override gate outputs in order to test the function of gates receiving that signal. In other words, we use a pulser to test gates "downstream" of where the pulser contacts the circuit. If a student suggests switch B failing open could cause the output to remain low, they are either misunderstanding the operation of an OR gate, or they are assuming switch A has also failed open (or something else happening that keeps input A low all the time). I find this kind of assumption frequently in students new to troubleshooting: assuming multiple faults. While multiple faults are not impossible, they are less likely than single faults. Therefore, the good technician first looks for single faults capable of accounting for all observed states before looking for (less likely) combinations of faults. This is a practical application of Occam's Razor. Then, measure the logic state of the lower input on the NOR gate (coming from the "B" switch). If students do not immediately grasp why the switches should be set as the answer indicates, pose the following scenario. Suppose they were asked to troubleshoot a simple light bulb circuit using only a voltmeter. The problem is, the light bulb does not come on when the switch is closed. Would it be best to proceed with their voltage measurements with the switch on or off? It should be easy to understand that having the switch in the off position would only interfere with the diagnosis, and that turning the switch on is the best way to reveal the fault (so that one could use the voltmeter to see where voltage is not present, but should be). Likewise, it is wise to set up this faulted logic circuit in such a way that the output ought to be doing something it isn't. This way, one may easily compare logic states as they are versus as they should be, and from there determine what type of fault could be causing the problem.